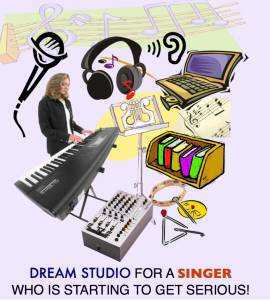 Careers in Singing - The Singer's Dream Studio! - What Do You Really Need? 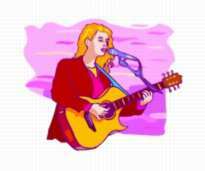 Careers In Singing - A Beginning Singer's DREAM STUDIO! There are a variety of careers in singing possible. Look here for more detail about the many things you can do in the field of music. 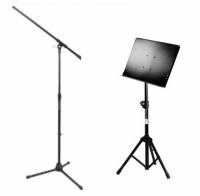 If your interest is specifically to become a solo (or choral) singer - a dedicated amateur or a budding pro - now is the time to think about assembling the right equipment to create your own studio. ...) or a great deal more! THIS IS "YOUR DREAM STUDIO" - PART ONE. The HOLIDAYS are coming! If this is a time of gift-giving in your culture, consider requesting some item as a gift! Or buy a gift for yourself or someone else who needs a creative boost! BUT NOW - Let's start with a microphone. to protect your mic against wind interference, popping "p's" and "t's" and singers' saliva. I remember the excitement I felt when I received my first microphone as a gift for Christmas. I felt that I was entering one of the most exciting careers in singing (singer/songwriter) and that microphone symbolized to me the dedication I felt towards becoming really good. I loved that mic! DIGITAL RECORDER - If you are considering having one of the many possible careers in singing, this is AN IMPORTANT PART OF YOUR STUDIO! 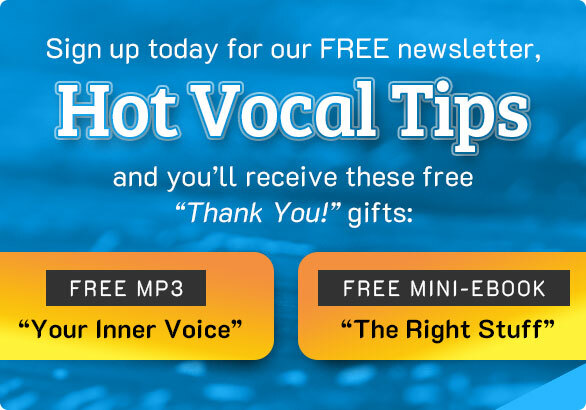 To improve more quickly, singers must be able to hear themselves. Quick feedback from a good digital recorder is almost like having another voice lesson. So take this piece of equipment seriously.
. Read my thoughts about my own use of the Zoom Portable Recorder. VOICE AMPLIFIER - For those of you who are new to this tech-world, an amplifier is a piece of equipment that will boost the volume of your voice. You sing through the microphone that is plugged into an amp and voila(! ), you are louder than you ever thought you could be. 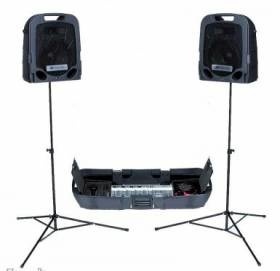 When my students give concerts in my home studio, I use this system rather than the single amp because the two speakers can be set at various heights and aimed in different directions. This equipment folds into a tightly packed hard plastic case. It is not what I would call, "light-weight," at 64lb (29.029 kg). But I have often taken it with me to rehearsals in small spaces. Having a mic stand gives you the flexibility to be able to hold the microphone or simply stand or sit in front of it to sing. Singers need to get used to singing in both these ways. The music stand frees your hands from holding sheets of music and lets you concentrate on singing your best. SUGGESTION! Buy sturdy stands. The lighter weight stands are less expensive, but they can fall over more easily. when you buy your microphone. Part Two (Careers In Singing): LOOK HERE! for more studio elements to consider for your developing career, (software, books and singing courses...) no matter your goal - amateur or pro. More on careers in singing here - 4 important things to consider before you get serious!